Baking with a longer, cooler dough process and your own yeast Good things take time! 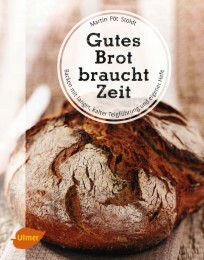 Here, Martin Pöt Stoldt, author of the bestseller Sourdough - the Unknown Organism, introduces you to the lost art of natural baking. Find out how to make your own yeast and with various dough processes (yeast pre-dough, long, cool dough processes, and appropriate addition of yeast and salt) ensure what commercial bread typically lacks - a full aroma, beautiful crumbs and potentially long storage times. With easy-to-follow, step-by-step instructions and more than 50 recipes from spelt bread to wholemeal flat bread and walnut horseshoes, the book is a unique treasure of knowledge to keep handy. Martin Pöt Stoldt beschäftigt sich seit über 30 Jahren mit der traditionellen Sauerteigbackerei. Anfang der 80er Jahre war das Wissen um den Sauerteig fast vergessen. Er grub damals das alte Wissen wieder aus und führte die traditionelle Backkunst mit reinem Sauerteig ohne Bäckerhefe behutsam in die heutige Zeit über.